I am feeling AMAZING today! The scale has decided to be my friend... oh how I love you scale (at least for today). The digits finally moved another 1. 6 pounds. Hallelujah! It started to get very frustrating when I saw the same number flashing before me every morning when I weighed myself, almost mocking me. Ha! But today persistence finally off. I guess that is why they tell you not to weigh yourself everyday but do I ever listen... NO!!! I can't help but want to check my weight and see how far I have come along if even for a measly 0.1 pound loss :) My scale and I have had this constant love hate relationship. I haven't had one of those late night binge sessions in about a week and I am mighty proud of myself. I really don't even know why these sessions happen except maybe out of boredom or a force of habit. Gosh, those bad habits are hard to break! I will say that since I started the Diet Bet challenge 2 weeks ago, it has really gotten me to be more focused on my weight loss. I just don't want to lose my money! Sorry, I am a sore loser. Especially losing when I know I can win because I control the outcome. Currently, things have started to look up for me. I feel more in control of my weight loss now more than ever. I am almost done with my Real Estate course so come on over to Nevada and I will sell you a house! Also I am extremely excited about going to Florida to see my family and friends this summer! Now we know what could happen when we go on vacation! Yes total slip ups and weight gain! I refuse to let that happen and I will show you how to prepare for vacation when the time gets closer! Here is a photo of my cauliflower all cut up in pieces in the slow cooker before it is cooked. I have to say that these mock "potatoes" came out delicious without a lot of effort. Just break the head of cauliflower into pieces. Throw them in the slow cooker and add a little bit of water. Sprinkle whatever seasonings you like. Cook on low for 4 to 6 hours. Drain in the colander. Then mash away! Easy peasy! The cauliflower gets a great roasted caramelized flavor which is different from just boiling the cauliflower in some water over the stove. 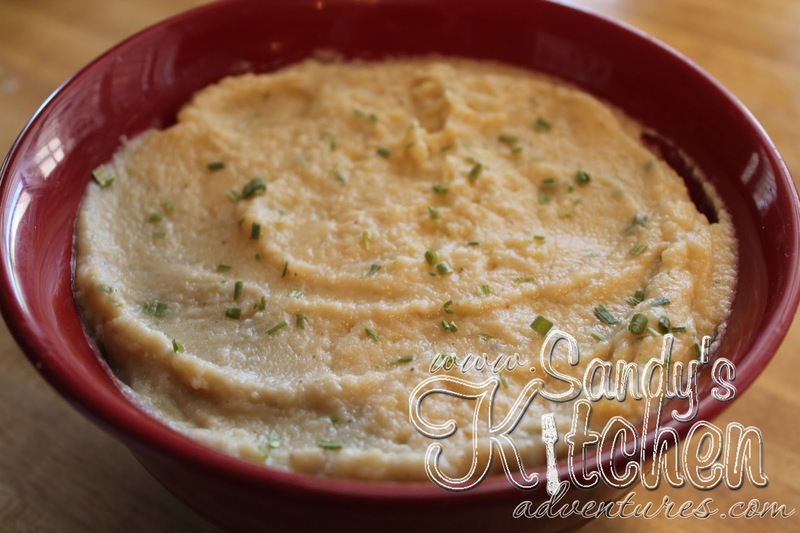 Another great way to use up your cauliflower! This is the finished product! Look at that smooth texture, just like mashed potatoes. I swear you won't miss mashed potatoes once you tried mashed cauliflower. The taste is very similar. If you want to check out Leah's You Tube video on watch her make this dish along side a pot roast, then check out this video! Here is the direct link to all her videos! FitAndFabBy40's You Tube Channel! Check her out! She has a lot of motivational videos to help you get that weight off, as well as reviews of Medifast products, recipes, and even other topics not related to weight loss! You will easily get hooked watching her! Rinse cauliflower well with water. Remove stems and leaves from the bottom of the cauliflower. Cut the cauliflower florets into small chunks. Place chunks in slow cooker and add water. Cook on LOW for 4 to 6 hours or until cauliflower is soft. 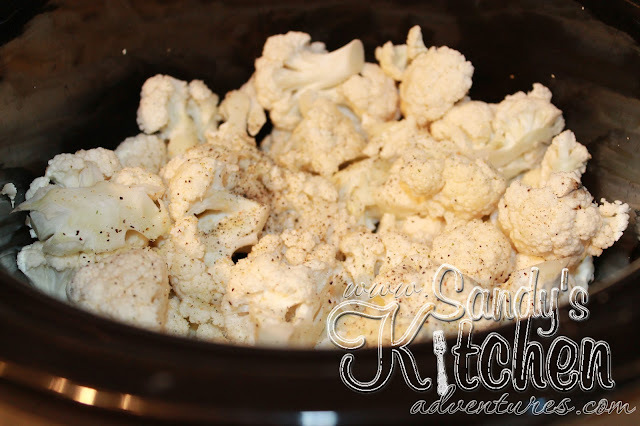 Drain cauliflower in a colander and place in a medium sized bowl. I like to measure out the cooked cauliflower into batches of 1 1/2 cups and then mash so I know how much GREEN I am getting. Mash with a potato masher or wooden spoon. I used my magic bullet to get a creamy texture. 1-1/2 cups of cooked cauliflower is 3 GREENS. Don't forget to deduct the spices from your condiments!